Grant and Rob discuss The Last Outpost, our first encounter with the Ferengi – a new Star Trek race of ‘yankee traders’ that the Federation have never met before. The setting for this meeting is a planet once part of an ancient empire of ham actors. 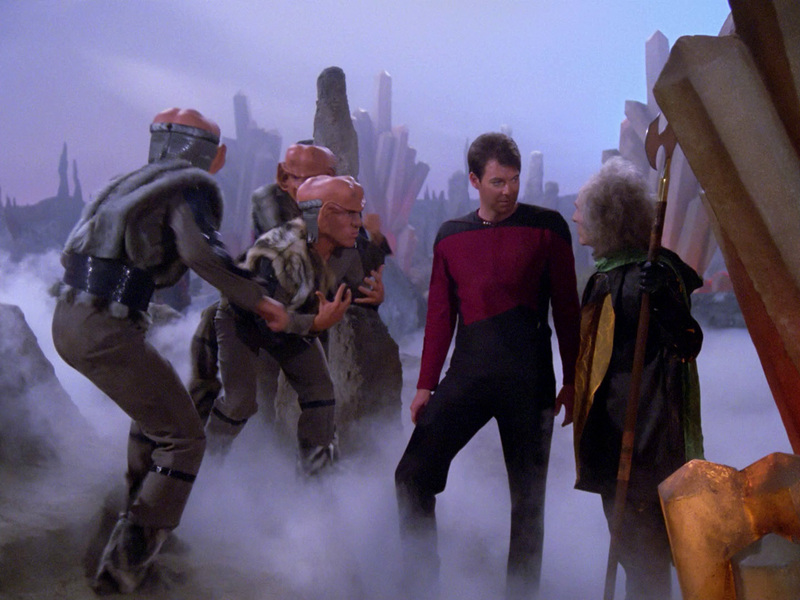 We see Worf being Worf and Riker sounding off… again. Posted in Season 1, TNGTagged Ancient Empire, Armin Shimmerman, Drake Equation, Ferengi, Quark, Riker Holler, WorfBookmark the permalink. I originally watched this episode on TV when it was first broadcast, way back when. Hadn’t seen it since then, but rewatching it very recently brought me sharply back to that old memory, the sensation that this episode’s characters were so powerfully stupid it may have left an afterimage on my brain. The doubled-up elephant-trunk laser whips! Even their weapons were ugly and idiotic-looking. And visually tracking the snarling Ferengi hop around might put you at risk for an attack of vertigo, were you genetically susceptible to it. Wow. By the time Deep Space Nine came around, I had come to think the hideous Ferengi were a stealth-genius invention, but not in this first incarnation. Glad they changed the character enough to make it vaguely watchable. The next time the Ferengi showed up—a few episodes later—they were much more interesting, had some nuance, and resembled a legitimately intelligent (if still rather asinine) lifeform.